Gaillardia, the blanket flowers, is a genus of flowering plants in the sunflower family, Asteraceae, native to North and South America. It was named after an M. Gaillard de Merentonneau or perhaps Charentonneau, an 18th-century French magistrate who was a patron of botany. The common name may refer to the resemblance of the inflorescence to the brightly patterned blankets made by Native Americans, or to the ability of wild taxa to blanket the ground with colonies. Many cultivars have been bred for ornamental use. These are annual or perennial herbs or subshrubs, sometimes with rhizomes. The stem is usually branching and erect to a maximum height around 80 cm. The leaves are alternately arranged. Some taxa have only basal leaves. They vary in shape. They are glandular in most species. The inflorescence is a solitary flower head. The head can have 15 or more ray florets, while some taxa lack any ray florets. They can be most any shade of yellow, orange, red, purplish, brown, white, or bicolored. They are sometimes rolled into a funnel shape. There are many tubular disc florets at the centre of the head in a similar range of colours, and usually tipped with hairs. The fruit usually has a pappus of scales. The cultivar "Arizona Sun" illustrated here provides a blaze of summertime colour that thrives, whatever the weather! There is a constant display of large flower heads in fiery shades of orange, yellow and red. The cheery blooms persist well into autumn, and make spectacular cut flowers for an indoor display. This low maintenance, hardy perennial is trouble-free and even copes well on poor, dry soils. Perfect for containers or filling gaps at the front of sunny borders. Beautiful flower! Love red and yelow colors! Like the spiky heart of this flower! Such a pretty photo, and so brightly colored! Hello Nick, this is a pretty pic. I love the strong bright colors. Have a good day. Hi! 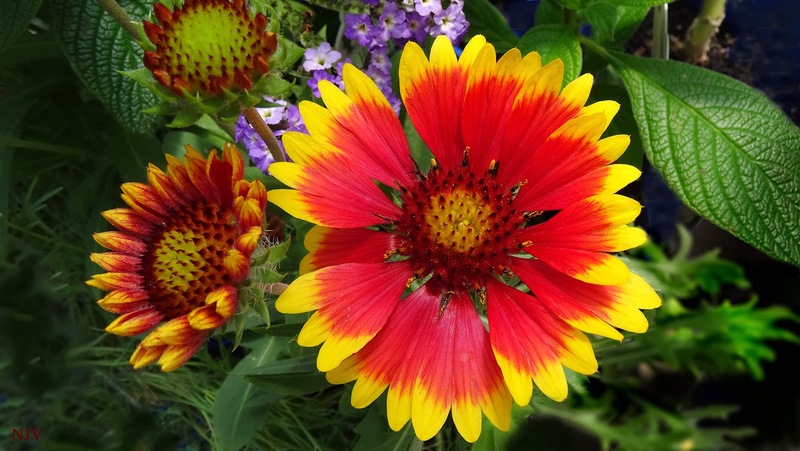 I love Blanket Flower! Yes, it does great in any weather. I have grown this plant in Virginia and sometimes I used to get flowers until Christmas. I also seen it here in Nebraska, in the summertime, along the Platte River growing in the wild and blooming like crazy. Wonderful colored blossoms, love it! I have just found this blog. Now I can find out more about the flowers I take photos of, but have no clue what they are. Here are my Hollyhocks for this week.